Could you please help me identify this plant? It is now at least 7-8 feet tall (some stems are longer) so, can you also tell me how to prune it? Thank you in advance. 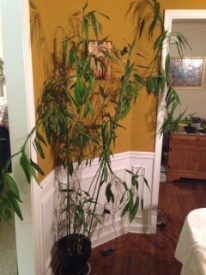 Your plant is a type of palm called Chamaedorea and more commonly called Bamboo Palm. Yours is overgrown and should be pruned back. When you prune back a Palm stem it does not produce new growth on that stem. However, it does help promote new shoots that emerge from the soil. I suggest that you prune the tallest, leggiest stems back all the way to the soil line. Your Bamboo Palm would benefit from better light, so place it closer to and right in front of the window, if possible. Allow the top 1-2 inches of soil to dry in between thorough waterings. Fertilizer and repotting will not help.